Digital Scales: Which Weigh To Go? I’ve run into a few questions of late that involve the weighing of ingredients. 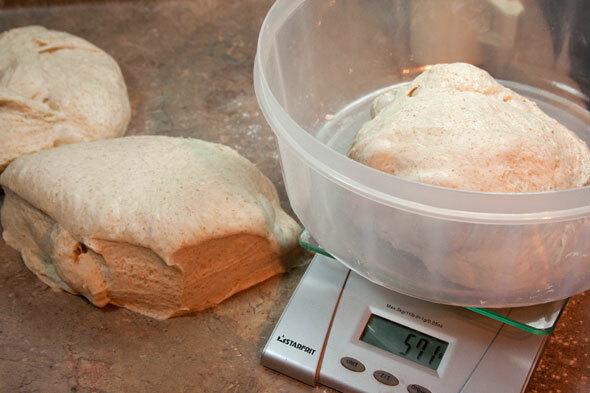 Some of the writers mention that they don’t have a scale and I wanted to point them to a good choice when they do decide to make the upgrade to weighing their doughs so they too can benefit from the multiple advantages of scaling. I realized that although I’ve talked about weighing in passing in many posts, as well as a slight rant or two about the benefits of weight over volume measures, I’ve not put myself behind any specific scales people could consider when they do go out hunting for this most important baker’s tool. I’m going to fix that here. There will be two levels of bakers to look at here: the hobby home baker and the professional (or expert home baker), both these levels having slightly different requirements. Primarily, the home baker will need something simpler, dependable and can do with an inexpensive model while the pros will (hopefully) have a bit more of a budget for this tool they depend on for their trade. This aside, there are aspects that both ends are in need of and even if a scale is in the lower price area, you will want to hit some points so your purchase will not become a frustration. Let’s outline some of these “must haves”, in no specific order. Just a fast note for anyone who bakes from the wonderful book “Bread: A Baker’s Book of Techniques and Recipes“ by Jeffrey Hamelman: Mr Hamelman has very kindly sent me a copy of his most up to date Errata for the First Edition of the book and has asked that I share it with everyone. This is a 6 page .doc file with many fixes for typos, correcting formulas and even making several changes in the more technical discussions at the beginning of the book. If you have this book, you want these corrections. The file is available HERE at MellowBakers and you simply need to download it. It does need a program that can read Microsoft Word (.doc) files. I’ve also created a .pdf version for those who prefer that forma which is also available at that link. This will make an astounding book even more… uhhh… astoundinger? Sure, let’s go with that! And if you don’t already have the book, yes you really should still get it! Or your local bookstore, of course. Just get it. How much does a cup of flour weigh? Here’s a question that seems to pop up on a fairly regular basis in the bread forums. Someone sees a recipe that requires 3.5 cups of flour, or one that looks for 368g of flour. Either way, they’re used to the other method of measuring and they run into problems making the conversion from one to the other. Why is it confusing? Because one is a volume measure and the other is a weight measure. As we all know a cup is not always a cup: a cup of rocks and a cup of feathers will not weigh the same. Simply stated, volume and weight are not a consistent and easily interchangeable form of measure. Add in the confusion of liquid vs dry ounces and cups and you have a mess. But there’s probably a set “standard” weight for flour, right? I mean, measuring flour is something people do ALL the time and have done for eons so someone, somewhere probably has The Definitive Weight for a “cup of flour”. Well, I decided to give the oven a good bake, so I put the bird in the basement in a closed room with a window then went and cranked on the Self-Clean for two hours. Man it stunk!! But that seemed to do the trick. Two days later, the Whirlpool folks reply saying “let your oven go at 450º for 1 to 1.5 hours and that should do it”. Well, it was at about 800 for two hours, so that did it too. Then I pop in a batch of cookies. No stink! The cookies were a “gift mix” from a friend, a jar full of cookie stuff I added an egg and water to. I even got the convection part going. Press “CONV” five times and it’s set for cookies! Not sure what it’s exactly doing on that semi-auto setting. But since I had fired up preheat then just plain CONVECTION already, I probably had two or three things going on so I dunno if any were in effect for real. 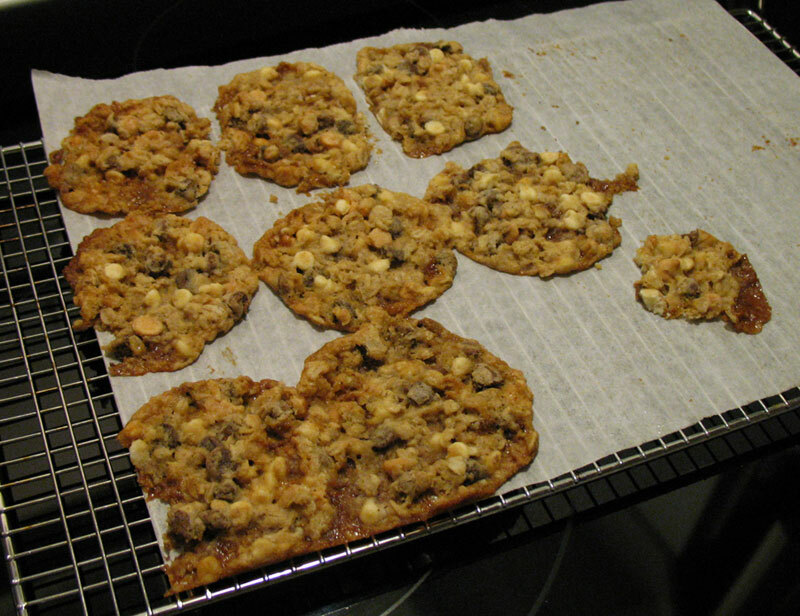 Cookies came out… fine, I guess. There was no problem with them overcooking or anything. I think the problem was too much “stuff” (choc chip, white choc chip, toffee chips and TONS of each) and not enough “cookie” to hold it all together. Still quite edible even if flattened and really not cookie shaped at all. BUT we now have a stink-free oven and it’s ready for some BREAD! 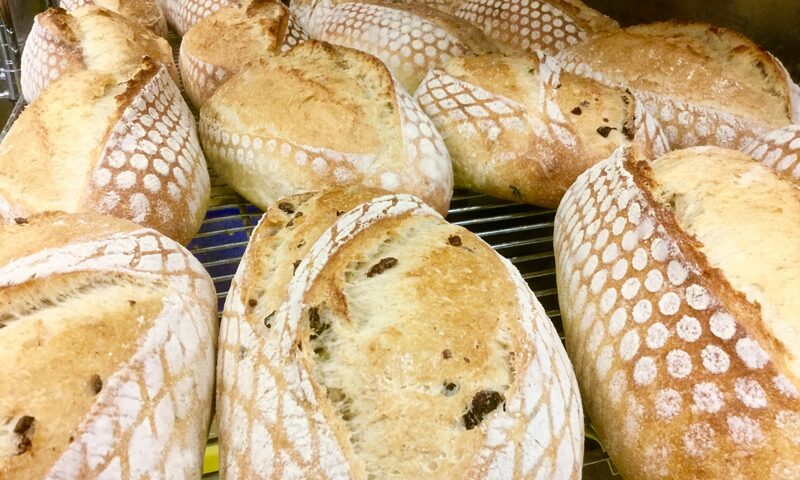 And so I will now start up on the The Bread Baker’s Apprentice Challenge and put this sucker to the test! (See recent entry for details). New stove’s here! More bread imminent! I can see this thing taking a few tries and likely glitches to learn and get used to it’s multiple functions. I’ll have to look online for video classes on steering this jet. Then there’s that “New Stove Smell”. Gotta burn that stuff off quickly so we can get baking (there’s some coating on the glass top too that has to get fried off). And it needs to be done when it’s nice enough outside to put the parrot there so she’s awys from deadly fumes during this starter stage. Hopefully this weekend. BUT THE NEW STOVE’S HERE!! WOOTNESS GALORE!